LOUISIANA PIRATE FESTIVAL - Louisiana Pirate Festival in Lake Charles! music, carnival rides, food & PIRATES! 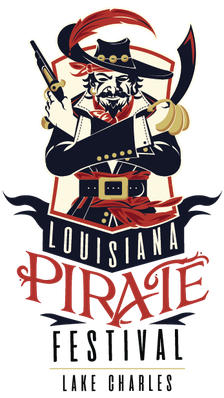 Check out the 2019 Louisiana Pirate Festival commemorative poster! Experience our unique pirate and seafaring festival with events on both land and sea. On the shores of historic Lake Charles, the Louisiana Pirate Festival showcases entertainment by a variety of talented musicians, performers and artists. Join us for a family-friendly event with cannon demonstrations, costume contests, local arts and crafts, themed souvenirs, games and attractions, including carnival rides and more! New to the festival - an amazing laser Light show! Make plans to see the sky light up on may 4 at 10:30 p.m. The Louisiana Pirate Festival was chosen as a Top 20 Event by the Southeast Tourism Society (STS). Events are selected from each of the following STS member states: Alabama, Florida, Georgia, Kentucky, Louisiana, Mississippi, North Carolina, South Carolina, Tennessee, Virginia and West Virginia. At Billy Navarre GMC...We Are Professional Grade!